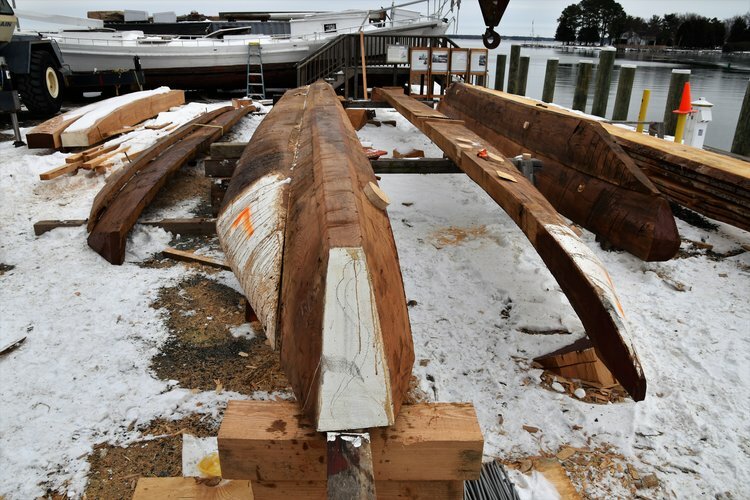 (ST MICHAELS, MD – January 17, 2017) Shipwrights and apprentices at the Chesapeake Bay Maritime Museum have identified all nine of the loblolly pine logs to be used in on the 2016-2018 log-hull restoration of the historic 1889 bugeye Edna E. Lockwood. The team is restoring CBMM’s queen of the fleet and National Historic Landmark Edna E. Lockwood by replacing her nine-log hull, in adherence to the Secretary of the Interior’s Standards for Historic Vessel Preservation. Shipwright apprentices working on the project are generously supported by the Seip Family Foundation and the RPM Foundation. All work takes place in full public view at CBMM’s waterfront campus on the Miles River in St. Michaels, Md., now through 2018. In March 2016, 16 loblolly yellow pine logs measuring more than 3-foot in diameter and over 55-foot long were delivered to CBMM after a two-year search, thanks to a very generous donation by Paul M. Jones Lumber Co. of Snow Hill, Md. With transportation costs of the logs underwritten by individual donors, the pine logs were trucked to St. Michaels by Johnson Lumber of Easton, Md., and submerged in the Miles River for preservation. This fall, the logs were moved onto the sawmill and rough-shaped as the crew began to identify which logs would be selected for the hull. 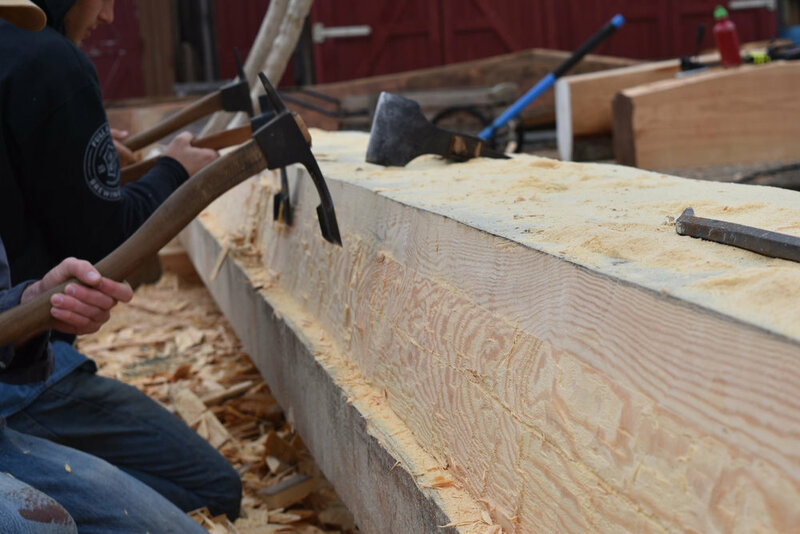 Over the rest of the winter, shipwrights and apprentices will be preparing molds for the outside shape of Edna’s hull, constructing her three cabins inside the boatshop, and continuing to shape and pin logs. The beginnings of the hull are on display now in the boatyard. 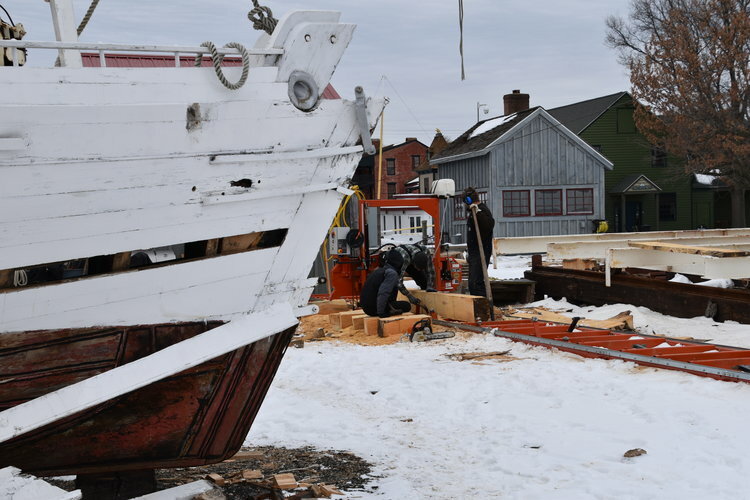 Through spring 2017, the new log hull will be assembled and the original four frames present in the bugeye will be located and installed to reinforce the hull. When the restoration is complete, Edna will be placed on the marine railway and re-launched at CBMM’s OysterFest in 2018. Built in 1889 by John B. Harrison on Tilghman Island for Daniel W. Haddaway, Edna Lockwood dredged for oysters through winter, and carried freight—such as lumber, grain, and produce—after the dredging season ended. She worked faithfully for many owners, mainly out of Cambridge, Md., until she stopped “drudging” in 1967. In 1973, Edna was donated to the Chesapeake Bay Maritime Museum by John R. Kimberly. Recognized as the last working oyster boat of her kind, Edna Lockwood was declared a National Historic Landmark in 1994. Edna is the last historic sailing bugeye in the world. Established in 1965, the Chesapeake Bay Maritime Museum is a world-class maritime museum dedicated to preserving and exploring the history, environment, and people of the entire Chesapeake Bay, with the values of relevancy, authenticity, and stewardship guiding its mission. Serving more than 75,000 guests each year, CBMM’s campus includes a floating fleet of historic boats and 12 exhibition buildings, situated in a park-like, waterfront setting along the Miles River and St. Michaels’ harbor. For more information, visit cbmm.org. Edna E. Lockwood: Bottoms Up!